We are dedicated to providing the highest level of satisfaction through our quality workmanship, top-rated safety products and excellent customer service. Like you, we’re committed to family safety and have made it our number one priority. It is our mission to provide families with peace of mind by creating an environment for their babies and toddlers to explore, learn and grow safely. We thrive to achieve this in the least possible amount of time and through practices that do not create damage to your property or furniture once the baby proof device is removed and no longer needed. 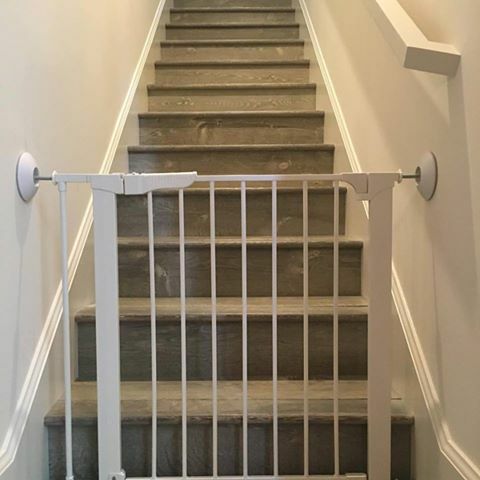 Pictured below is an example of a baby gate installed by Baby Safe Homes San Diego. Bottom of stairs baby safety pressure gate, installed with wall sabers to protect drywall from damage. As can be seen the baby safety pressure gate placed at the bottom of the stairs was put in place with sabers to protect the drywall from damage. It’s also easy to use and has an open auto locking door. Don’t rely on low-quality products. Invest in the safety of your child and in keeping your home damage free. or call 888.481.7233 to find the Baby Safe Homes safety expert nearest to you!